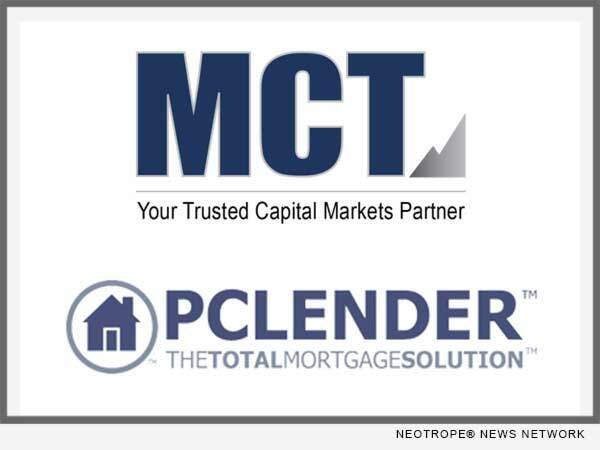 SAN DIEGO, Calif. /California Newswire/ — Mortgage Capital Trading, Inc. (MCT), a leading mortgage hedge advisory and secondary marketing technology firm, announced that it has completed an integration between its secondary marketing solution and PCLender’s loan origination system (LOS). The integration seamlessly transmits critical hedge pipeline data, saving time and enhancing information security. The integration enables mutual lender clients to streamline an otherwise manual data transfer process, allowing them to pass and populate loan details from PCLender’s LOS to MCT’s hedge model. It reduces the risk of market movement and ensures the optimization of mutual clients’ hedge positions. Mortgage Capital Trading, Inc. (MCT) is a capital markets-focused risk management and advisory services company providing capital markets services and software to clients engaged in the secondary mortgage market. Founded in San Diego, California in May 2001, the company has expanded to include operations offices in Philadelphia, Dallas and Santa Rosa. MCT is a recognized leader in the industry and currently supports more than 150 clients on the HALO (Hedging And Loan sales Optimization) Program. The company also develops and supports MCTlive! (TM), an award-winning real-time, trading and best-execution secondary marketing platform. MCT’s LockCentral(TM) is the industry’s largest outsourced centralized lock desk service. In addition, MCT offers a suite of tools and supporting guidance for MSR needs. For more information, visit www.mct-trading.com or call (619) 543-5111. PCLender delivers simple, elegant, internet-based mortgage solutions for community banks, credit unions and mortgage bankers. With a proven record of providing immediate return on investment, PCLender is the most comprehensive SAAS solution available. Owned and operated by mortgage banking executives, PCLender collaborates closely with lenders to meet their needs in the constantly changing world of mortgage lending. For more information on PCLender, visit www.pclender.com.